Like a Pro participants have put in over 12 thrilling sessions – led by Premiership Rugby coaches, and funded by the Movember Foundation. 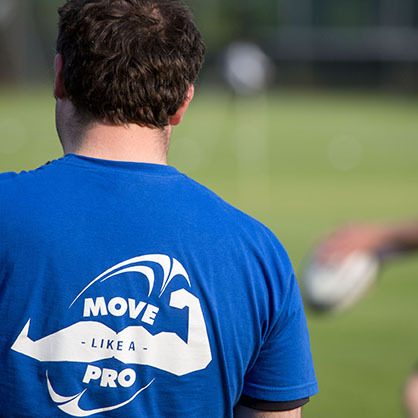 Aimed at men aged 30–55 who achieve less than what’s set out by the National Health Service physical activity guidelines, Move Like A Pro has finished its second 12 week season – with a total of 450 men successfully completing the course. Each of the Premiership clubs who participated in the program (which is the brainchild of Premiership Rugby and the Movember Foundation in partnership) aimed to get men living happier, healthier and longer lives through physical activity and social connections. And that they did. A fantastic example of the rugby family coming together to give a remarkable experience to rugby supporters within the community, this program has led a number of clubs to continue with touch rugby sessions across the summer. In our books, that’s a big success. The Movember Foundation and the sport of rugby have been intertwined through the moustache for over a decade now – with a huge number of Mo’s present on international and club players every year – from Dylan Hartley to Richie McCaw. As such, Move Like a Pro is the foundation’s chance to give back to the sport, and build on the great work we have achieved. Initially set up to help men improve on physical health over 12 weeks, Move Like a Pro has now evolved into a program focused on so much more – namely the mental health of men as well. Both physical activity and spending time connecting with friends can encourage better eating, less drinking and smoking, and ultimately longer lives. For men on the field, this solution brings the key ingredients of health together. The results? Overwhelmingly positive. As shown in feedback from participants, high levels of completion rates, and the number of ongoing group sessions set up and run by participants after each cycle of the program wraps up. The hard work of the men involved in Move Like a Pro will come to an exciting head this weekend, with the Move Like A Pro Grand Final being held at Kneller Hall. Coincidentally, this falls on the same weekend as the Premiership Final at Twickenham – just next door. A morning of friendly competition – including a touch tournament and celebration of everything our legendary participants have achieved over the last 12 weeks – it’s going to be a big one. We’re expecting 125 participants to join us for the festivities. After the sweat has subsided, we’ll catch a breath before watching the Premiership Final afterwards. "I would like to say a big thank you to all of you at Premiership Rugby, the Movember Foundation and Saracens. I knew I had to address some of my lifestyle choices, and am glad that I had the opportunity to do so – thanks to you all. I have lost over 9 kilograms in weight, and my lifestyle has changed for good. We learned so much useful information about lifestyle changes – and the energy and determination of Ruth and Del to help us make these changes was incredible. I know that all of the guys that attended the sessions at Saracens got so much from the 12 weeks, and we now keep in touch. We had so many touching stories to share – which for a bunch of fat blokes to sit and talk about was amazing. Not only were our brains filled with the vast knowledge on offer, but our fitness levels improved enormously. It is a shame the sessions have only lasted 12 weeks, but thank you so much – on behalf of all of us – we have made big, life changing, life prolonging choices." If you’re interested in finding out more about Move Like a Pro, or getting involved in the hairy month of Movember later this year, just email info.uk@movember.com.